The RAID is a disk grouping system that allows you to read and write to disks in a specific way, thus offering you greater security and speed than ungrouped hard disks. This tutorial is going to be developed in Linux, so, in order to continue, we have to install the tool we are going to use. In order to create a RAID, we must first know the disks that our computer has, so, we have the following command. Once this has been done, we can then move on to setting it up. This RAID distributes the data between the different disks, this means a higher write and read speed, but if a disk stops working, the information is lost. To create RAID 0, let's use the following command. To see if it has been created correctly and to be able to locate it, we have two options. Using the command of the first option, we get the name of the RAID, so now we can use it to identify it and see more information. After executing this, we have to enter some specific values. Now we can see the changes we have made to create the partition. Now we are going to format the partition we have created previously, when creating the partition you will have assigned a different name to the RAID partition, so, we need to know to use it next. We are going to mount the partition to be able to access it, therefore, we create the folder where we want to mount it. If we want to delete the RAID, first we have to stop it in order to delete it, then we delete all the information from the disks so that the grouping disappears. This RAID duplicates the data between the different disks, this means more security, but the speed of writing and reading does not improve. 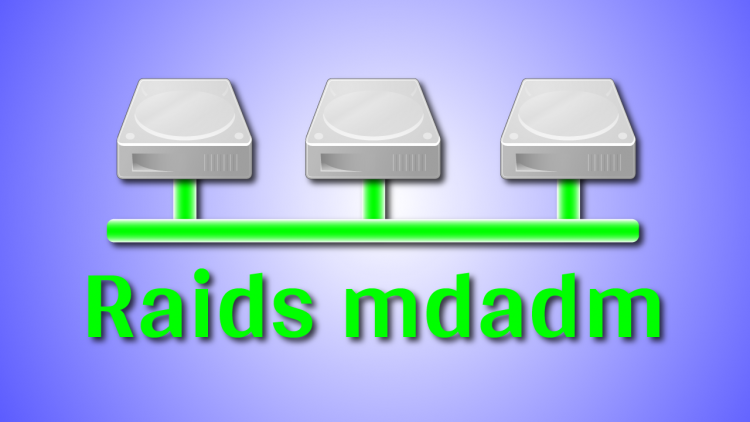 This RAID distributes the data between the different disks adding parity, this means a higher read and write speed, and allows up to 1 disk to fail. Later we create the RAID 5 using the 3 Raids 0 previously created.